Koh Tao ( "Turtle Island") is an island in Thailand located near the western shore of the Gulf of Thailand. It covers an area of about 21 km². Administratively it forms within the district Koh Phangan of Suratthani Province. As at end 2006 its official population is 1382. The main settlement is Ban Mae Hat. The economy of the island is almost exclusively centered around tourism, especially scuba diving. 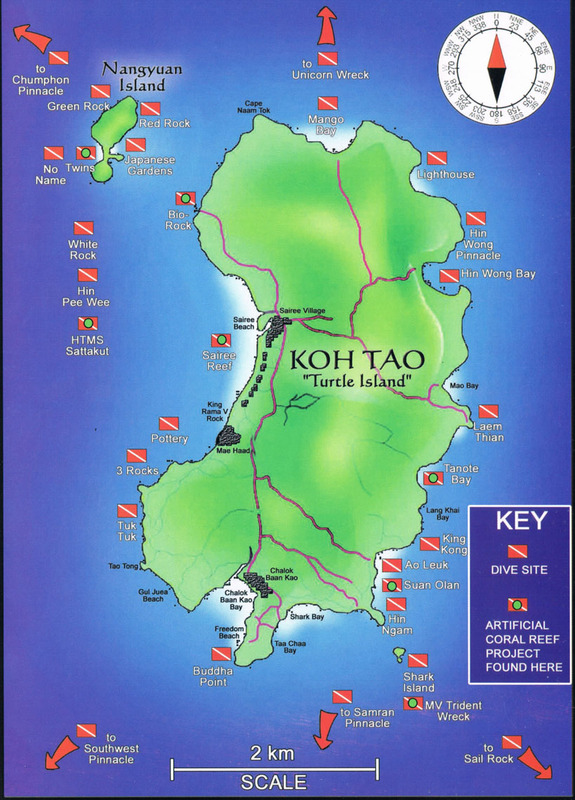 Koh Tao was named by its first settlers for the island's turtle-like geographic shape. Coincidentally, the island is an important breeding ground for Hawksbill turtles and Green turtles. Development of tourism has negatively impacted the health of these grounds but a breeding program organized in 2004 by the Royal Thai Navy and KT-DOC, a coalition of local scuba diving centers has reintroduced hundreds of juvenile turtles to the island's ecosystem. On June 18, 1899 King Chulalongkorn visited Ko Tao and left as evidence his monogram on a huge boulder at Jor Por Ror bay next to Sairee Beach. This place is still worshiped today. In the 1980s the first travelers discovered Ko Tao and their special backpacker network quickly made it widely known and a popular destination. As a consequence, bigger, faster and safer boats were used to allow easier access to Ko Tao. In the 1990s the island finally became known as a diving site. The island is well known for scuba diving and snorkeling, and also offers some hiking. Diving conditions have improved dramatically in the past few years with the continuing education of locals by the dive community. The El Nino weather pattern of 1997 caused a warming of the waters which resulted in the loss of a great deal of the shallow corals near the island. Since then, the recovery has been swift and dramatic. Chumpon Pinnacle, a dive site to the west of the island has a reputation for divers in search of both whale sharks and bull sharks.